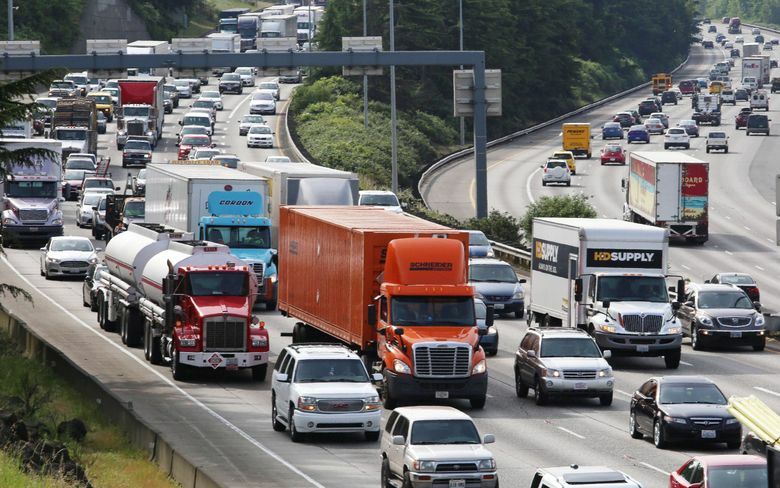 After I-1631, what’s next for trying to put a price on fossil fuels in Washington state? For the past four years, a big policy proposal has dominated the climate-change policy debate in Washington state: how to put a price on the state’s oil, natural gas and coal emissions that are helping to warm the world. The resounding defeat for Initiative 1631 in Tuesday’s election marks the latest failed effort to pass such a measure, and proponents are unsure of their strategy once the Legislative convenes next year. Bills to spur a transition to cleaner sources of energy are likely to be introduced, but putting a price on carbon – which generally means making fossil fuels more expensive to discourage their use – faces an uncertain future in Washington state. A recent United Nations report described carbon pricing as an essential tool for fighting climate change. But the 2018 election results underscore the difficulties in mustering enough political support — even in Washington, a stronghold of the environmental movement where Gov. Jay Inslee has made the issue a priority and endorsed Initiative 1631 in TV ads. The ballot measure would have raised more than $1 billion by 2023 for a governor-appointed board to spend on: reducing greenhouse-gas emissions and helping the state prepare for rising sea levels, larger wildfires and other impacts expected from climate change. And by increasing fossil-fuel costs, the measure was intended to speed the transition to renewable and other sources of zero-carbon energy. The measure attracted national attention as a potential model for environmental action at the state level. At the same time, I-1631 galvanized record opposition spending — largely from oil companies — of more than $31 million, which financed an advertising blitz that warned of economic pain to consumers and small businesses. Estimates varied greatly on how much I-1631 would cost Washington residents depending on where people lived, how much they drive, and how they heat and obtain electricity for their homes. A family with two cars in Bellevue, for example, would have paid more than $240 annually in carbon fees in 2020, and more as the fee increased through the decade, according to a Seattle Times estimate. Voters in 36 of Washington’s 39 counties rejected the measure, according to vote tallies released Thursday afternoon. In five rural counties east of the Cascades, more than 80 percent of the votes counted so far have been against the measure. “We drive such a distance … if you have a major medical issue it might be an hour and half drive to the hospital in Spokane … We rely on fossil fuels,” said Mark Stedman, a commissioner in Lincoln County, a wheat-growing agricultural hub where 85 percent of voters so said no to I-1631. In the populous stronghold of King County, the measure passed — but with less than 58 percent, and short of the margins needed to overcome the opposition votes elsewhere in the state. “As soon as I saw that, I knew it was doomed. 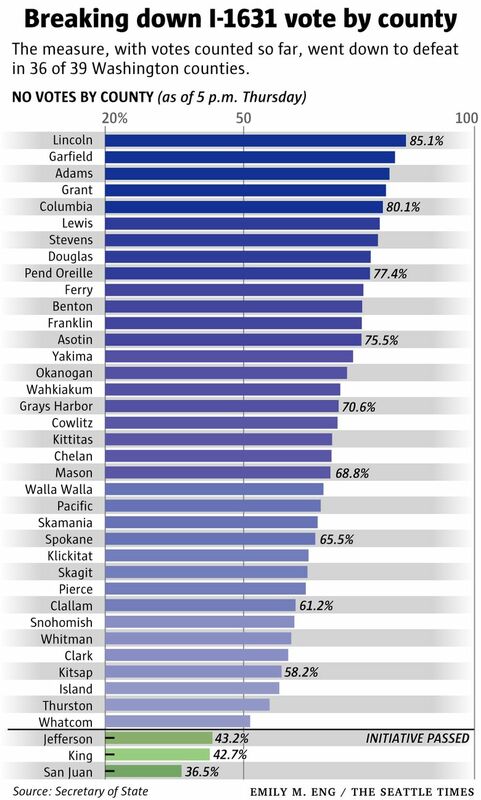 They needed over 60 percent (in King County),” said Todd Myers, of the Washington Policy Center, who wrote a critical analysis of the measure. Statewide, I-1631 gained less than 44 percent of the yes votes counted as of Thursday. Voter rejection of the measure comes two years after an even greater thumping of Initiative 732, which captured less than 41 percent of the vote in 2016 for a proposal that would have coupled a carbon tax with cuts in sales taxes. The Legislature during the past four years also has taken up carbon pricing. State politicians did not pass early legislation from Inslee to impose a cap on greenhouse-gas emissions along with a system — already in place in California — for companies to buy and trade pollution allowances. Inslee then switched to a carbon-tax proposal, which during the past legislative session was repeatedly amended during an unsuccessful push to gain passage. All of this frustrates Inslee, who has not ruled out a possible presidential bid in 2020 and has hoped to contrast state action on climate change with the federal government’s lack of progress under President Donald Trump. Inslee says he is still committed to acting on climate change, and he will hold discussions in the coming weeks to decide legislative priorities. “Climate change is going nowhere and neither are we,” Inslee said Thursday in Seattle. A spokesman for BP, the largest contributor to the No on 1631 campaign, said the company is willing to join that dialogue and help shape a Washington approach to carbon pricing. “BP has long believed that a well designed carbon price is the best way to achieve reductions in emissions. That belief has not changed,” said a statement released to The Seattle Times. BP officials attacked I-1631 as poorly designed — and invested more than $12.8 million to turn Washington voters against the measure. And, after the defeat of I-1631, it is unclear whether Inslee or legislators who endorsed the initiative want to start over with another attempt to draft a tax, fee or cap and trade bill to price carbon. Inslee, as well state Sen. Reuven Carlyle, a Seattle Democrat who chairs the state Senate Energy, Environment and Technology Committee, said all options are on the table. But they would not commit to a renewed effort at carbon pricing. Rep. Joe Fitzgibbon, a Burien Democrat who chairs the House Environment Committee, said he would like to focus on other measures to reduce greenhouse-gas emissions. They include a bill, which failed to make it through this past year’s Legislature, to phase out fossil-fuel production of Washington’s electricity by 2045. He also would like to gain passage of another measure that has struggled in past sessions — a low-carbon fuel standard that would increase the use of alternatives to gasoline and diesel to lower greenhouse-gas emissions. These fuels that power Washington’s transportation fleets represent the biggest source of carbon pollution in Washington state. “The oil industry very much opposes this bill, and I’m sure they will work very hard against it — it’s not a policy that they support,” Fitzgibbon said.